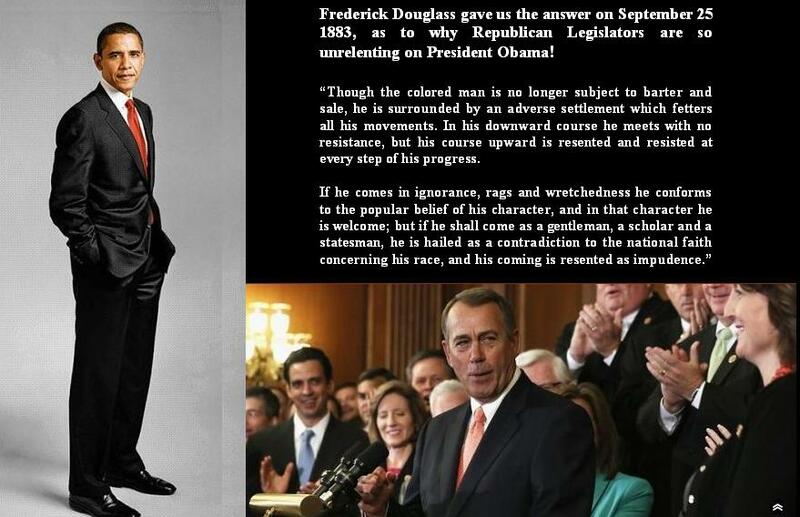 The Subversive RNC – “Racists Narcissists Cryptococcosis,” punishing America for reelecting Obama! DESPITE THE ONSLAUGHT BY “MANY” WHITE POLITICIANS, OBAMA STILL STANDS TALL! 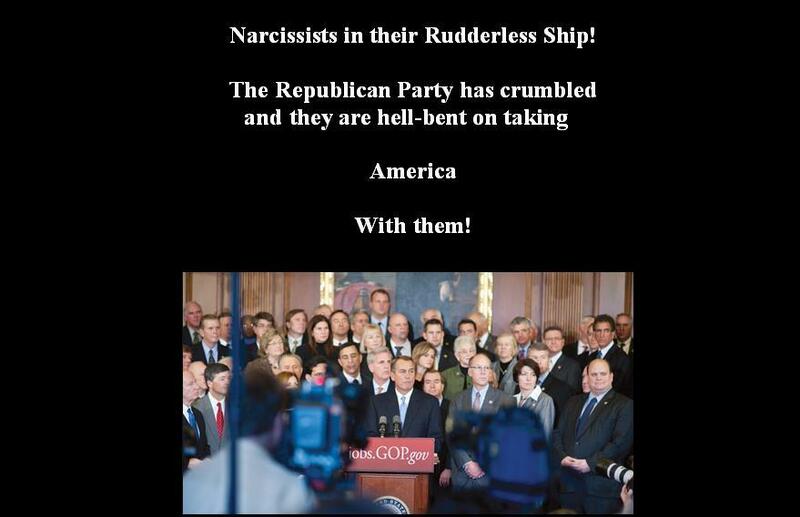 The RUDDERLESS Ship of John Boehner and his band of NARCISSISTS are hell bent on tossing America into the ABYSS! The Republicans that controlled the White House, The House of Representatives and the Senate from January 20, 2001 until 2008 that literally bankrupted the Country and created havoc around the world, the Voters that got severely hurt financially and otherwise, reinstalled these DESPOTS to control The House of Representatives again in 2010 and 2012. Do you ever see or hear the Politicians complaining about their Health Insurance? No! And that is because they have the best but desire the worst or no Insurance for the people that voted them into Office. 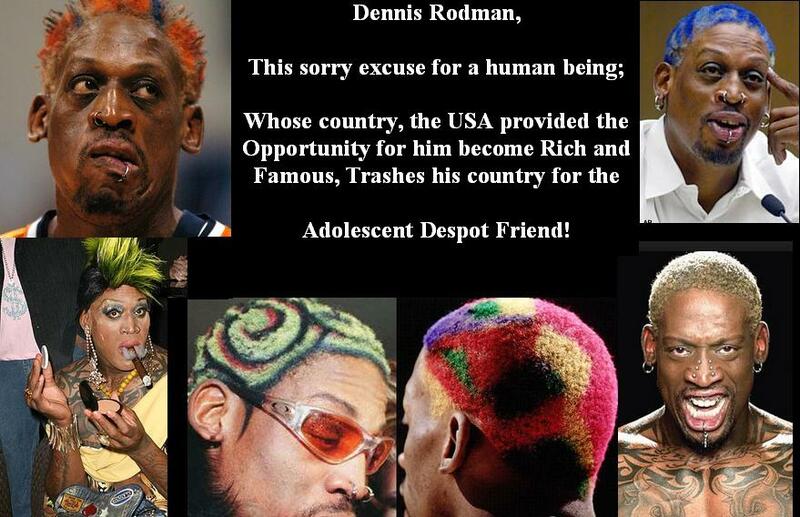 It is one thing to dislike the President, but, it is plain stupidity to buttress the Politicians that are using your uninformed or brainwashed minds, as an evil means to an evil end for their own personal self gain. Republican Congressional Representatives in both the Senate and the House are in the pockets of big business and they are day after day, feeding you false information that somehow the Health Care Reform Act that was upheld by the United States Supreme Court, is a train wreck for you. When are the uninformed and brainwashed Americans going to wake up and determine for themselves, what is or isn’t good for them and their children. You can no longer be denied Health Insurance if you have a preexisting condition! Your Insurance can no longer be canceled if you or your child falls ill! Your children 26 or under that is still living with you can remain on your Insurance! Your fellow citizens that live in the category of Poverty, they and their children are finally able to obtain Health Coverage that is subsidized by the Federal Government! The Right Wing in this country that are always espousing God and Patriotism and yet seek to repeal the Health Care Reform Act that “actually” help the poor 40 Million men, women and children to finally be able to have some form of Health Insurance, I wonder how these barbaric hearts sit with the God they espouse and their disdain for their fellow Citizens? 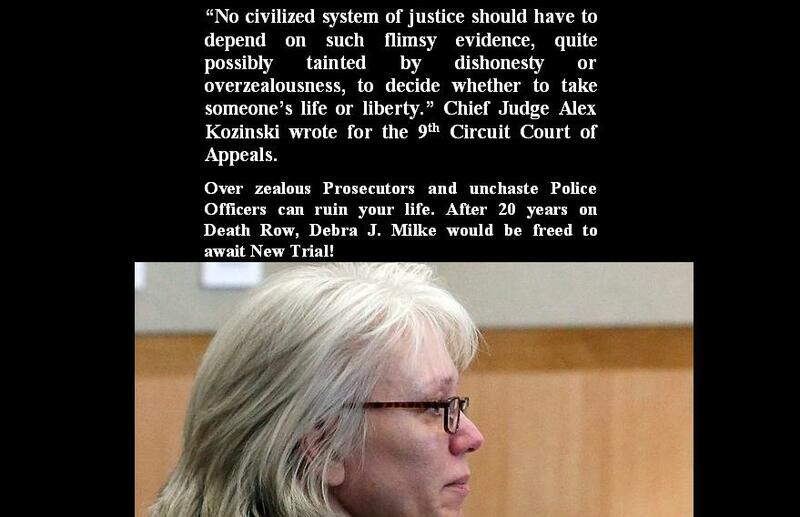 After 20 years on Death Row, Debra J. Milke would be freed to await New Trial! “No civilized system of justice should have to depend on such flimsy evidence, quite possibly tainted by dishonesty or overzealousness, to decide whether to take someone’s life or liberty.” Chief Judge Alex Kozinski wrote for the 9th Circuit Court of Appeals. Overzealous Prosecutors and unchaste Police Officers can ruin your life. Judge Rosa Mroz of Maricopa County Superior Court set Debra Milke’s bond at $250,000 Thursday, saying there’s no direct evidence linking her with her son’s death other than a purported confession to a detective. And, the judge said, the validity of that confession is in doubt. Sheriff Joe Arpaio said Milke would probably be released Friday. Defense attorney Michael Kimerer said in an email that Milke could be released Friday afternoon, but provided no other information. If she is freed, Milke’s lawyers have said she plans to stay at a home that supporters bought for her in the Phoenix area. She has been imprisoned since 1990. Prosecutors say Milke had her son, Christopher, killed to collect on a $5,000 insurance policy. She allegedly dressed the boy in his favorite outfit and told him he was going to see Santa Claus at a mall in December 1989. She then handed the boy over to two men who were later convicted of taking the child to the desert and shooting him. The possibility of freedom comes six months after a federal appeals court overturned Milke’s conviction, ruling that the prosecution should have disclosed information about the truthfulness of the now-retired detective who testified that Milke confessed. Milke was a 25-year-old insurance company clerk when her son was killed. Now 49, she has maintained her innocence, saying she had nothing to do with the slaying. The two men convicted in the case both remain on death row. Neither Roger Scott nor former Milke roommate James Styers testified at Milke’s trial. Scott confessed during a police interrogation and led detectives to the boy’s body. Maricopa County prosecutors are still seeking the death penalty against Milke, and her alleged confession is at the heart of the case against her. Police detective Armando Saldate Jr. testified at Milke’s trial that she confessed to him in a closed interrogation room. But Saldate’s honesty was called into question during Milke’s appeals. The 9th U.S. Circuit Court of Appeals concluded in March that prosecutors’ failure to turn over evidence related to Saldate’s credibility deprived Milke’s attorneys of the chance to question his truthfulness before jurors. “No civilized system of justice should have to depend on such flimsy evidence, quite possibly tainted by dishonesty or overzealousness, to decide whether to take someone’s life or liberty,” Chief Judge Alex Kozinski wrote for the court. The court noted four cases in which judges threw out confessions or indictments because Saldate lied under oath and four instances in which cases were tossed out or confessions excluded because Saldate violated the suspect’s constitutional rights. He was also suspended for accepting sexual favors from a female motorist he stopped and then lying about the encounter, the court said. Deputy County Attorney Vince Imbordino argued last week during a bond hearing that the purported confession is still admissible, but Mroz said the undisclosed material concerning Saldate “casts serious doubt” on its validity. The judge scheduled a Sept. 23 hearing on the defense’s request to prohibit the prosecution from using the confession during the retrial. “Much has transpired since the original trial,” Mroz said. Milke’s ex-husband, a man named Arizona Milke, is convinced his former wife was involved in their son’s murder. He said Thursday he intends to sue her, the state and Saldate for what he believes is a conspiracy to conceal the boy’s real killer. 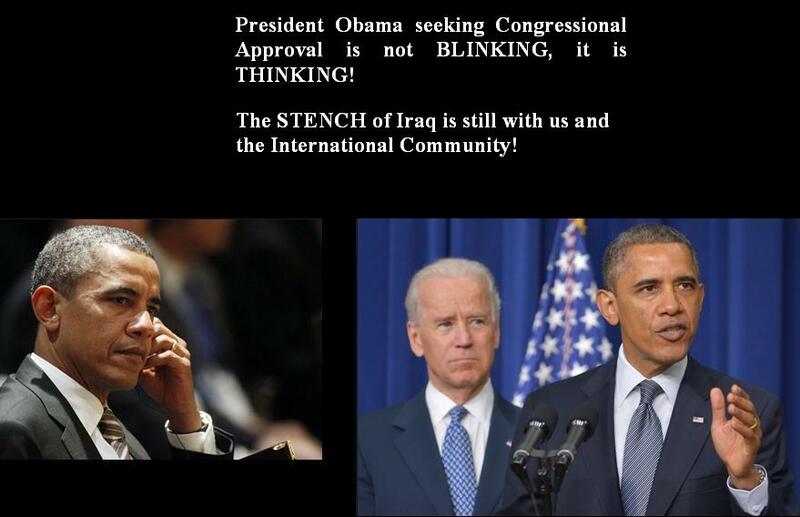 President Obama seeking Congressional Approval is not BLINKING, he is THINKING! Obama is not trying to win a Civil War in Syria, he is seeking to punish and dissuade the Syrian Regime on any further use of Chemical Weapons. The United States and the World has a moral obligation to carry out this action. The International Community banned the use of Chemical and Biological Weapons in 1925, subsequent to World War 1, and the ban was reinforced in 1972 and 1993. Over the past two weeks President Obama and his administration clearly stated that the President “did not” make any decision on how he was going to handle Syria, but was looking at the options provided to him by his Military Advisors. It was only on Saturday August 31, 2013, the President announced that he has made the decision to strike Syria, but he was going to seek Congressional Approval. 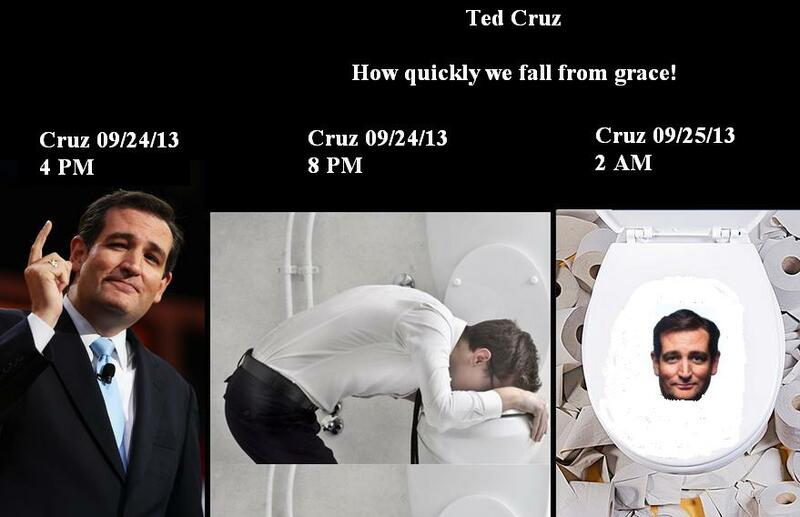 Amazingly enough, this criticism was not limited to the usual suspects; Fox News and CNN. I was most surprised to see David Gregory of Meet the Press, verbally tormenting Secretary of State, John Kerry, solely because the President sought Congressional Approval. The Syrian Government’s use of Chemical Weapons against its own people, is not just an American problem, it is the World’s problem. Thus, it is only fitting that President Obama seeks to have International Assistance in the case of Syria. The problem with the rest of the world is that they agree that what the Syrian Government did by killing over 1,400 of their own people [some 400 children] with the use of Chemical Weapons is a crime, but they stop short on offering any assistance. In addition, the War Weary Americans do not really want America to be involved in another war, and short of saying no, the American people by 80%, requested that the President seek Congressional Approval before any Military Action is taken. It is amazing to witness the criticism of President Obama when others thought he was going to by-pass Congress and when he did not, they criticize him for doing so! You are damned if you do and damned if you don’t!